Capable of spinning steel tubes as large as 24-in. dia. by 40 ft. long, with wall thickness to 1.5 in., into pressure vessels for the industrial gas and chemical market, an OSC-24300 metal-spinning machine from MJC Engineering & Technology, Huntington Beach, CA, has been installed at FIBA Technologies, Millbury, MA. Driven by a 300-hp motor, the machine incorporates a tube-handling system and an automated induction-heating system. It spins tubes with a necking-in and/or bottom-forming operation performed at each end. At the heart of the machine, which measures more than 80 ft. long, are MJC’s proprietary Spin Cad software and a Siemens Sinumerik 840D CNC with HMI software. Spin Cad is a Windows-based operator interface that allows the machine programmer to generate spin passes on a computer using point-and-click technology. All machine functions and editing are controlled and saved through Spin Cad. When the program is complete, Spin Cad generates a G-code program that the CNC uses for part forming. FIBA Technologies manufactures pressure vessels, tubes and other industrial equipment for storing and transporting high-pressure and liquefied gases and chemicals. It serves major industrial and specialty-gas and chemical suppliers worldwide, as well as the U.S. government and industrial-gas distributors throughout the United States. 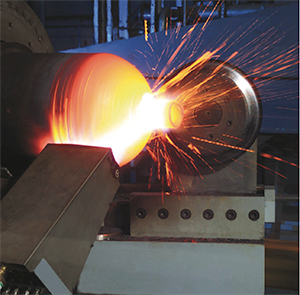 In working with MJC, it sought a machine that could spin the ends of a large steel pipe to fabricate unfired, seamless, integrally forged pressure vessels.